Liatris punctata attracts hummingbirds and butterflies. Also known as Spotted Gayfeather. Hardy in zones 3-9. 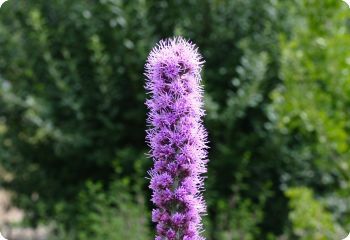 Liatris, also known as Blazing Star or Gayfeather, is a perennial wildflower with tall spikes of purple flowers in late summer to fall. Start liatris seeds indoors in winter. Barely the seeds cover with soil, then refrigerate for 8 weeks. Full sun to part shade. Spacing 15". Liatris spicata is a native prairie wildflower. The tall spikes of purple flowers attract hummingbirds and butterflies, and the ripening seeds attract birds. It's a host plant for Painted Lady and Silvery Checkerspot butterfly larvae. 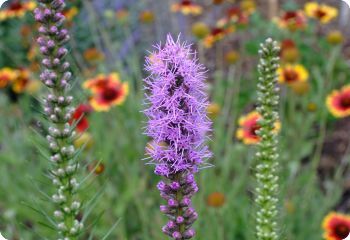 Liatris spicata is equally at home in wildflower gardens or formal borders. It blooms in midsummer, making it a great companion plant for echinacea, gaillardia, rudbeckia and ornamental grasses. Liatris spicata is adaptable to a wide range of climates and conditions. Hardy in zones 3-10. Also known as Kansas Gayfeather. Hardy in zones 3-9. Liatris ligulistylis is wonderful for attracting butterflies, especially Monarchs. Birds feast on the ripening seeds in the fall. 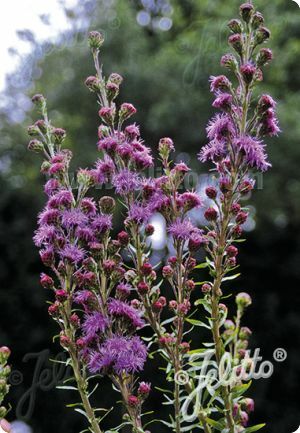 Liatris ligulistylis can grow up to 5 feet tall, so you may need to stake it in the garden, especially if your soil is rich or moist. Drought tolerant and deer resistant. Hardy in zones 3-9.